CORN PUDDING is a classic holiday side dish recipe. Your holiday table isn't complete without this easy corn pudding recipe! This delicious side dish is the perfect complement for Thanksgiving foods such as turkey and greens or Christmas favorites, especially ham. YUM! 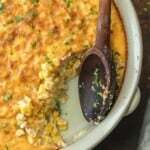 Find out how to make corn pudding with this recipe. Preheat oven to 350° F and spray a 9x9 or 1½ quart casserole dish with cooking spray. In a small bowl, stir together sugar, flour, baking powder, salt and red pepper flakes. In a large bowl, whisk together eggs, cream and melted butter. While whisking, add sugar mixture to the egg mixture. Whisk until smooth. Add corn (and bacon, if using) and stir until combined. Pour mixture into sprayed baking dish and bake at 350°F just until set in the middle and golden brown, 45-60 minutes.